He is survived by Donna (née Coates), his devoted wife of seventeen years, brother Richard, children Tricia Scott, Cheryl Streeper, Dale Metzger, Nicole Shafer, and stepdaughter Mindy Honey and their families, as well as fourteen grandchildren and two great grandchildren. Also remaining are Gary and Donna’s beloved dog and cat, Jeter and Scooter. 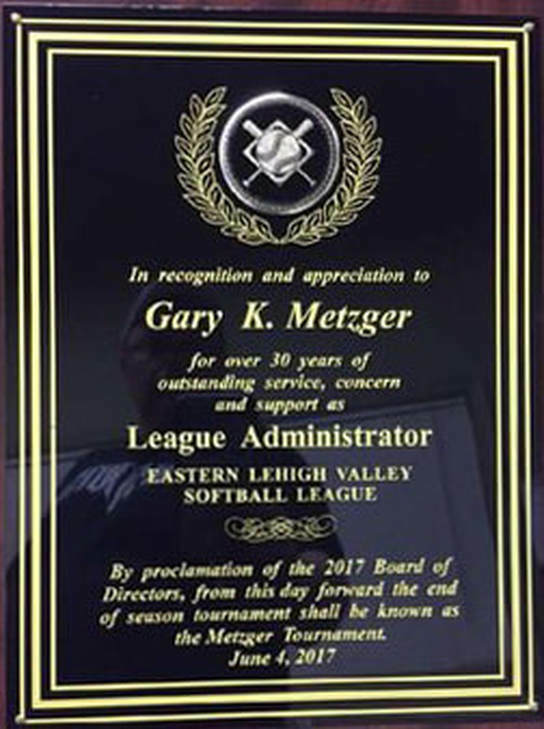 As Eastern Lehigh Valley Softball League's Administrator for literally generations, if your daughter has played recreational softball in the eastern part of the Lehigh Valley, in some way Gary likely had a hand in them being able to play. For those of you who were fortunate enough to work with Gary or who knew him, you know he was one of a kind. For those who may not have known him well, he was opinionated, never backed down from a tough call, and most importantly showed an enormous dedication to both community and youth sports. A typical year for Gary would include about 600+ hours of volunteer time because he would take on the work of 2-3 people. As sad as everyone is to lose a man we consider a friend, we are equally saddened to see the game of softball lose a true friend and leader. May the path he blazed be followed by many others for many years to come. Be well and because life is too short, hug your favorite softball player a little tighter!